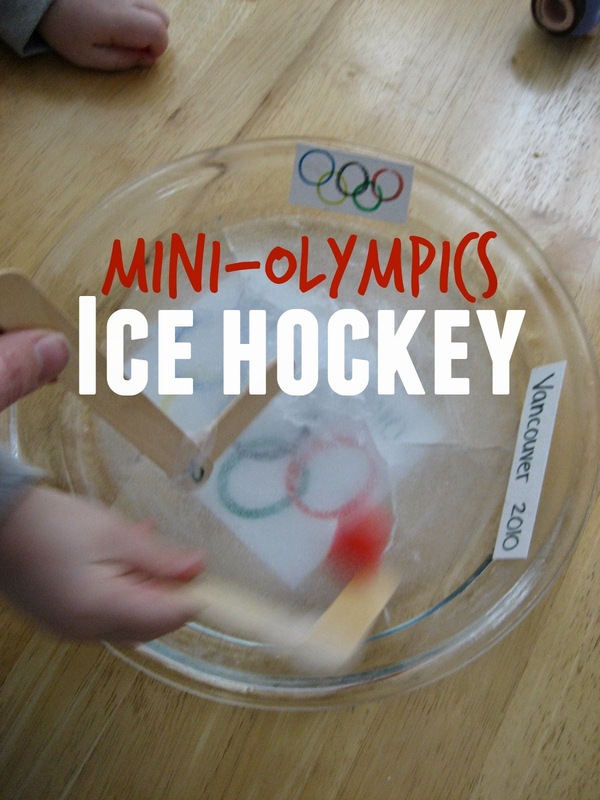 We are big hockey fans at our house and my little guy loves anything that he can hit... so we decided to hold our own Mini Olympics ice hockey game. Me vs. the little man. We also made a little figure skater out of pipe cleaners. Materials Needed: pan (round or rectangular- we wanted small, so I went with a small pie pan), two cups water, freezer, markers, piece of white paper, three tongue depressors, something to use as the puck (we used pom poms and craisins), scissors, and tape. 1. Pour about 2 cups of water into your pie pan. 2. Freeze pan filled with water overnight (or until it hardens). I just did it the night before we needed it. 3. Decorate white paper with Olympic rings and words. Older kids can do this by themselves, younger kids will need some help. Cut out drawings. These will be used as advertisements for under the ice and around the ice. 4. Take frozen rink out of freezer and decorate with Olympics drawings. We just stuck our big Olympics ring picture under the pie pan (since you could see through it). 5. While my little guy let his favorite toys skate around the ice, I made two quick hockey sticks using tongue depressors and tape. 6. Cut one tongue depressor in half and tape one piece to the bottom of one tongue depressor and the other half to the other tongue depressor. The hockey sticks aren't anything fancy, but were popular with my little guy. 7. Drop the puck on the ice and start playing! The pom poms tended to fly around a lot, so we switched to craisins. My little guy loved launching the pom poms around the room with his stick. With older kids I would do this using a 13X9 pan and possibly create some goals that they could shoot into. We weren't looking for a competitive game, so this activity was just fun to pass the puck around to each other and try and steal it from one another. 8. Once we were done with hockey, we made a little figure skater out of pipe cleaners and she danced around a little bit on the ice until the rink started to melt and needed to go back in the freezer. We found another similar idea at Silly Eagle Books that we also loved! Make and Takes also did a fun ice rink using aluminum foil. Next time I would probably spend some time decorating our hockey sticks as well, but we only had a short period of time to do this activity today. Words I reviewed/introduced were: ice skating, ice skater, hockey, puck, hockey stick, rink, pass, hit, and Olympics. While we played we talked about what our sticks or our ice skaters were doing! Pretending to be a Sports Announcer and describe what is happening is also a great way to practice language. We are planning to watch some hockey and ice skating on TV or the internet later today to reinforce the words we learned.